last week's church times had a 5 page section looking at new monasticism and communities engaging in mission with that sort of imagination. one of the featured stories was earlsfield friary who have worked with the local church to transfrom the church grounds into a community garden with allotments and a labyrinth. johnny sertin who is one of the founder members of the friary teaches the mission spirituality module on the pioneer course. 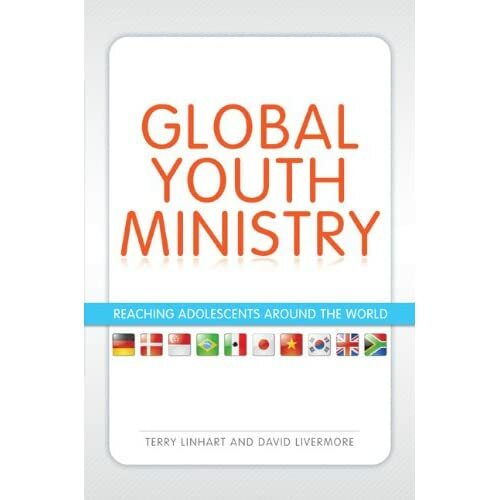 terry linhart and dave livemore have co-ordinated a huge effort in pulling together global youth ministry which is released today. i have a chapter in the book. it's been a while since i wrote it so i can't exactly remember what i've said but it's along the lines of the development of seeing the practice of youth ministry through the lens of cross cultural mission. but looking forward to the book landing on the doormat and seeing the contributions of people from round the world. there's an excerpt here it you want to get the flavour. A national day conference exploring how the mixed economy can thrive in deaneries, circuits and synods. Working towards a church in which tradition and dynamism, established ministry and fresh expressions of church inform, energise and complement each other. 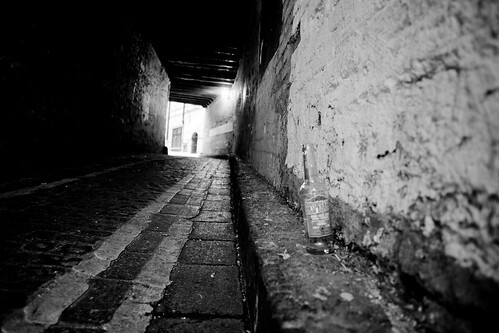 beyond in brighton have created lent through the lanes - if you are anywhere near brighton go and experience it. collect a headset and the meditations are automatically triggered at the various stations on the journey. 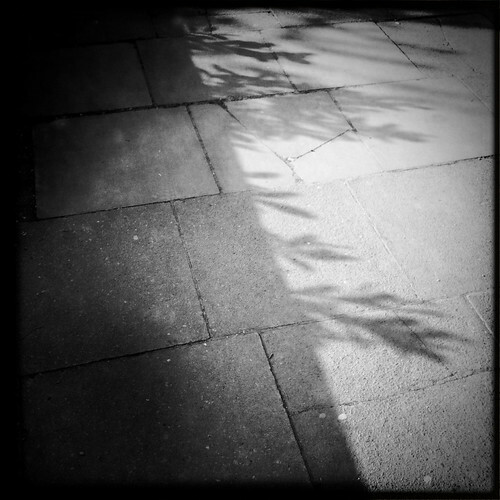 shadow walk, originally uploaded by jonnybaker. more lineup announcements from greenbelt today - mavis staples is playing which is wonderful! harry baker also gets annunced in the lineup which made me smile. he's putting together what promises to be a pretty stonking line up for a spoken word night. 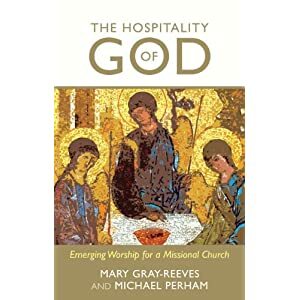 the hospitality of god: emerging worship for a missional church is the result of a journey of two bishops - michael perham and mary gray-reeves. they visited anglican emerging/new/alternative/missional churches/christian communities in the uk and the usa experiencing their worship and liturgies. this book is the result of their reflections on that experience. it's 146 pages and easy to read. it's delightful, hugely generous and encouraging. they have clearly really enjoyed the journey. the book weaves together descriptions and stories of their encounters trying all the while to discern themes, discoveries, patterns and challenges along the way. they then seek to try to ask what the mainline/inherited churches might learn from the emergent and vice versa all the while focused around worship. they suggest that the emergent churches are quite small and the movement will probably never be huge but like a lot of renewal movements in the church it's impact will be widespread. in the second chapter they lay out 20 principles that undergird anglican worship. i've not seen quite such a succinct accessible summary and i suspect it will be used in many courses on worship - i'll use it when i teach pioneers who are anglican i'm sure! and they reflect on each principle how emergent churches sit with those. the reason i say the book is hugely generous is that the lens with which they approach this (which reflects the title of the book) is really welcoming of this newness that is emerging as wholeheartedly part of the tradition and offering gifts to help the tradition be renewed. there's no sense anywhere of an attitude that 'you're not welcome because you're not obeying the rubric'. if anything it's the other way round - they are open to sensing that the rubric may need to listen and change because of some of the challenges of what the spirit might be doing. so to take an example one of the anglican principles they identify is prescribing who can take communion via canon law. they suggest that this was the most universally broken piece of canon law in the emergent churches - all the communities create a theology of radical welcome and hospitality around the table. in fact they go so far as to suggest that the table and font have reversed positions (literally in one community) in that the table is near the entrance, a place where all are invited but baptism is something that is considered later. i found this incredibly interesting in itself but also loved the openness to receive this positively by michael and mary which they later descibe as a trend developing by stealth! there are chapters that unpack different themes - music, ritual and gesture, authority, use of god's word and so on - all of which are good. i supect the big themes/challenges are around shifting notions of authority, welcome and inclusion , and eucharistic theology. then the final chapters develop further what emergent churches and inherited churches might have as gifts to offer each other and they identify five of each. so for example the sense of being church globally and down the ages - the church universal - they suggest is a gift that could be discovered more by emergent churches who are quite locally focused and have quite short term horizons. and likewise emergent churches approach to planning worship in creative and participative ways (curation though they don't use the term) could be a gift for the inherited. the overwhelming theme is welcome - so for a moment all those people who have pioneered communities like this where hospitality is so central allow yourself to feel affirmed for a change! how delightful that two bishops visiting find this the central theme they have encountered. The title of this book The Hospitality of God reflects what has seemed to us to be a major emphasis of the emergent churches, laying stress on God's desire to be welcoming, hospitable, inclusive, inviting. For ourselves wherever we went we encountered something of that unconditional hospitality, reflected in the communities and especially in their leaders, giving of themselves generously to us. We found them to be deeply impressive Christian ministers of high intellectual calliubre, of mature faith and spirituality and pioneering adventurers, whom the church should honour. Cranmer Hall will host its first virtual open evening on Thursday 24th March from 7.30 p.m. to 8.30 p.m.
We are particularly excited about hosting this innovative event. It will allow a wide range of people including prospective ordinands and independent students to gain a flavor of Cranmer Hall in advance of making a visit for interview. no i am not in west bromwich! the church of england newspaper had a great article last week on a couple of the people doing the pioneer course at cms. the main story was on helen and her comedy club in birmingham. there was also a second piece about andy who is involved in mission amongst young adults in west bromwich. somewhat embarrassingly the names got mixed up so it was attributed to me so if you were wondering - no i am not in west bromwich - still in london! 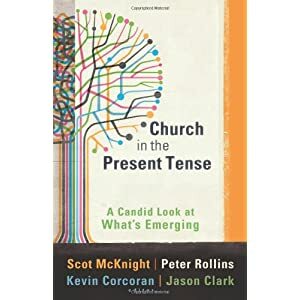 anyway all that by way of an intro to say that kevin has pulled together a new book - church in the present tense which i sense has emerged from those visits, conversations and reflections on mission. it landed on my doormat last weekend and even though i had other things to do i found myself making a coffee and reading it through pretty much straight away. it has four authors each of whom contribute 2 chapters. the authors are kevin, jason clark, pete rollins and scott mcknight. then there's a dvd with interviews with the likes of pete, me , kester, jason, and rowan williams. i feel almost embarrassed writing this list and have to get this out of the way up front - with a title like church in the present tense why are none of the authors or interviews with women?! ouch... if you've seen or been involved in the comments on the new monasticism review/post it won't surprise you me mentioning it. it was the first thing i noticed and i just think it is such a shame and will probably reduce the readership of the book. anyway that's a bit of a negative opening comment but i enjoyed the book. i liked the stance of the book - it is holding open different perspectives on theology, mission and church that clearly disagree with one another in places but are trying to talk about it honestly. that's refreshing (though i think it might have been improved if authors had a chance to comment in some way on the other chapters). so for example kevin gets into philosophy (philosophy is not my hot area i confess) to debate philosophical realism - he suggest that the emerging conversation needs humility about truth claims but that doesn't mean you can't say things that are real - for example jesus christ is risen from the dead. i am sure there will be more conversation about this. it's a critique of pete and caputo amongst others i think. it did make me think that the emerging conversation probably gets caricatured as being into this debate much more than it is. or maybe it is a bigger debate in the US. there's a small subset who read the likes of derrida and zizek and heidegger but a huge number who probably don't (i have read none of them) but sense that postmodern cultures definitely throw up some new questions around truth. this chapter is one of two in a section on philosophy - pete writes the other. then there are scetions on theology, worship and bible and doctrine. the first is a bit tongue in cheek but having lambasted the process of 'organic' 'cell' 'emerging' or whatever as consumer solutions or fads to then propose another - 'deep church' - seemed a bit ironic, a bit rich! it is awfully close to another consumer fad - there are already books on it, conferences, blogs, and money to be made. it also doesn't sound too different to me than what i have perceived already as being sensibilities of many involved in the emerging church - at least in the uk a lot is located in and out of the historic denominations and drawing on the ancient practices. secondly whilst i totally agree about the challenges of consumerism and formation i worry about the solution being offered - a different grammar and identity formation that is counter cultural. i do think a grammar is important. the key question is what is that grammar and how is it imagined - i guess i am asking not just how formation happens but what kind of formation. many strands or denominations of church articulate this sort of approach - whether the brethren or mennonites or anglican community or whatever. what they do is create a strong sense of community and with a grammar that has identity in it. so people experience formation but it often forms them in a way in my view that is too disengaged from the wider culture. i am finding it hard to describe what i sense here. what i have loved about the alternative worship movement and i think why it inspired me originally is that it had a very different instinct around culture (which has been formative in me) - a much more sacramental view of popular culture. so by being part of it i have found that i am formed in a way that does give me a grammar of the christian story and discipleship but it has formed me in a way to discern the presence of god within culture not apart from it. that's why some of the things jason critiques - trickster, starfish and spider i have no problem with as being sources of inspiration and sites for theological reflection. somehow i think you need grammar as jason is suggesting, but i don't think saying you need grammar goes far enough - let's have grammar that shapes people in christian identity but in a way that empowers them to live in the culture. jason loves the local church and that is classic baptist ecclesiology so it makes perfect sense and it's great. local church needs advocates. but i perceive an inherent criticism of others that are focused in other ways in mission. what i was arguing before in the review of new monasticism is that church needs both local and movement expressions (sodal and modal). the local congregation is not the be all and end all - it is important and i am part of one but i find my life in mission enriched and fueled by being part of cms for example which is itself an expression of church as a spread out community. i am also intrigued by some of jason's critique - how many people are there who are proposing a way forward for the emergng church who don't see being part of an embodied actual community as essential? i am sure there are some but i don't know of many. his second chapter is on worship. this connects strongly with the first. he has discovered a rhythm and grammar in liturgy, in the church calendar, in the seasons of lent and advent, in the eucharist, in catechism. this is a very different place to where he started in baptist and then vineyard worship and i am guessing is probably somewhat shocking to those who knew him there. having grown up in the anglican church myself i grew up with this grammar or rhythm of liturgy in the church - this is the kind of grammar/shape that we use in grace and i think many others have rediscovered as treasure in the traditions that perhaps they were shunning in the seventies and beyond. i hope these can continue to be opened up imaginatively. i recently read jamie smith's book desiring the kingdom which i have been meaning to review and haven't had time to. there is a chapter in there on worship that is making a very compelling argument similar to jason. my reaction to that though and to this was - it's not enough on its own. this is very similar to what i have tried to say above. when i read jamie's book i was thinking of the life of worship at a traditional denominational theological seminary for example - it ticks the boxes of what he suggests but i still have huge questions about it. it seems to form people in a particular religious way that can be cut off from engagement in mission with culture. so i think it's needed and am on a similar journey to jason and jamie albeit i started much closer to it by being part of a denominational church. but this kind of formation also needs some good mission thinking and cultural theology alongside it (which i have no doubt jason's church embody so it's not a critique of that). so it sound great and i agree but i am also a bit cautious. we need some more thinking and conversation about formation. we are having another open day for the pioneer training course on may 19 so if you didn't make the last one come along. details here and you can download a prospectus if you want to know more about what we are up to. there's also the latest quarterly newsletter available to download here. this includes a few headlines from research into the experience of pioneers (that was done by fresh expressions). i can't remember if i have mentioned this or not (being new to wordpress) - if you are interested in news about the pioneer stuff we are doing at cms go to the web site, scroll down the right hand side and click to subscribe and whenever there is a new post you get it in an e-mail. but the big surprise to me has been the resurgence of interest in monasticism. where did that come from and why?! if you had suggested 10 years ago that i would be a signed up member of a religious community in the church of england i would probably have either laughed or raised my eyebrows. language obviously chops and changes and i'm sure some people are thinking this is just a fad that will pass like the others but of all the waves that have come i think this has plenty of staying power and plenty within it to resource the mission imagination of the church into the future. that's not to say that the other things haven't got staying power - there are many themes that have been birthed through those movements. i suspect it's when you weave together the gifts of them all that something richer starts to emerge. i know not everyone is on board - in fact i quite like pieces like dave andrews which lambast the notion of people taking themselves too seriously as abbots. it's always good to be reminded that there are always a range of perspectives and there's a danger of taking ourselves too seriously. and even though i am a member of cms i don't think of myself as a new monk or friar particularly though, some others think that language fits. at a practical level i think the reason new monasticism has come to the fore is that the religious societies have discovered great wisdom over the years about how to live and sustain the christian life in community. there are many notions at the heart of it - one that has given us great inspiration in grace is the idea of ethos at the heart of community life that leadership guards and calls the community to (as opposed to a set of practices we must all adhere to - not that there is anything wrong with practices). another is wisdom about the rhythms of community itself - so much sought after and needed in today's culture. and then a word that seems to be bouncing back - discipleship - the challenge of living out a life of faith in consumer culture has proved a depper challange than pretty much anyone expected. monasticism has patterns of life, prayer and worship and the notion of a rule of life that community commits to together which have the potential to help form a discipleship in community that cuts deeper than doing the latest course. 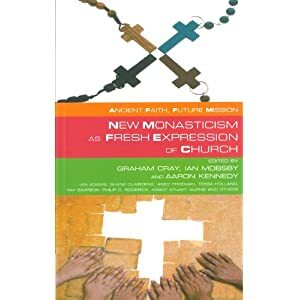 this blog post started in my head as a book review so i suppose i ought to get onto mentioning that... new monasticsm as fresh expression of church is a great intro to this subject. i think it's a very good book - it has coherence and hangs together well even though it's a collection of chapters by different people. graham cray give an excellent introductory chapter and there are contributions from the likes of ian mobsby, mark berry, shane claibourne, ian adams that explore a range of themes. stuart burns gives a reflection at the end of the book - he is the abbot of burford priory and has been a source of great encouragement to the new kids on the block. he sees this movement as a sign of hope and i thought there was wisdom in his cautioning groups to not be too hasty to look for institutional/official recognition lest they lose their prophetic edge but to concentrate on community life following in the way of jesus christ. i know from cms experience that the institutional piece takes a lot of time and energy. i also welcomed ian mobsby's challenge to move beyond values to consider a rule of life for a community. i want to come back to the title of the book because there is more to it i think than at first glance. it might seem that monasticsm is a fresh expression of church in the way that say moot or maybe are a local community living out of an imagination and rule inspired by monasticism - i.e. it's about fresh expressions of local church. but there is something else that's at play. there's an argumentto be made that church has always had a mix of local gathered expressions and missional spread out expressions. so in the new testament you have the travelling apostles and the churches in corinth and ephesus. monastic communities have at their best carried a challenge and a mission energy as part of church often in spread out ways. tim dakin at cms suggests that the mission societies needed to be born following henry 8th's dissolution of the monastries because this aspect of church was lost. in some ways the emphasis in church in our imaginations has never fully recovered the dual notion of the spread out and the gathered. we usually associate the word church with the local congregagtion or community within its hierarchcical structure/denomination. i am stumbling over words here. i don't know how to say it succinctly. if you want a piece of theory which i'm reluctant to mention because i can never remember what is what in it - ralph winter's work on sodal and modal expressions of church as two structures of god's mission makes the case. modal is the local gathered and sodal the spread out focused around a mission task (at least i think it's that way round!). so new monasticism as fresh expression of church in this way is for example what cms is about. we have moved from being an organisation (though there is still one) to a religious community that is in itself an expression of church and not parachurch (something subsidiary on the side of church). it doesn't mean that i am not going to be part of a local church community - grace - in fact part of my commitment within cms is to live out a life of mission in a local community. but church writ large has always been better understood when imagined as this dual expression. i'd welcome any thoughts on this or any pieces of theory that might shed light on it. this is a new way (for me at least) of thinking about the mixed economy of church so succinctly described by rowan williams in the intro to mission shaped church. it's not just a mixed economy based on locality - i.e. because one size no longer fits all we have various local expressions that reach out in mission to various groups (which has laid itself to criticism in various circles because it seems too co-opted to consumer tastes - is it incarnational or sold out?! discuss...). but it's a mixed economy in its modal and sodal expressions. if you are looking to live out a life of mission and are isolated in that you could look to join a community like cms which would help support and fuel your life of mission?! this isn't meant to be a sales pitch - you'd need to seriously digest the constitution and so on and see if it was a good fit - i'm more making the point around the mixed economy. in many ways networks, and communities of practice and other things are also part of the mix of the network/economy of christ. i think the difference that the monastic piece brings is much more intentionality and commitment. it's harder to just stay skating on postmodern surfaces. congratulations to ian mobsby and graham cray and aaron kennedy and others for pulling together a great contribution to this current suprise in the ever emerging church of jesus christ. today's wisdom from munsons. just getting into mobile blogging - i have been able to do it before but the typepad app and camera combined in the iphone mean i'm more likely to. not my best photo ever! we put a couple of new movies up on proost this month - cave and calavary. cave is a movie exploring the notion of cave as a place to retreat to to be alone with god. It was inspired by ian adams book cave refectory road. the other is called calvary and much more geared for the other end of lent and good friday. it's a photographic piece exploring stations of the cross. desperado, originally uploaded by jonnybaker.